As the passage of AB 398 has strengthened and extended California’s Cap and Trade program, we think our readers will benefit from a spotlight on the trends in the carbon credit market. As such, we periodically feature guest articles on California’s Cap and Trade program from our friends at CaliforniaCarbon.info. CaliforniaCarbon.info is a comprehensive information service covering the Western Climate Initiative (WCI) carbon market in North America. CaliforniaCarbon.info provides emissions and price forecasts, and regular analysis of the allowance and offset market. We are excited to feature their expert analysis on California’s Cap and Trade program and the forces that impact the carbon credit market. Look for regular articles from Stillwater’s LCFS Newsletter featured at CaliforniaCarbon.info. Entities that are covered by the California cap-and-trade program have an annual compliance surrender obligation, in line with their emissions that year. Entities can fulfill the annual and triennial compliance obligation by surrendering compliance instruments. Eligible compliance instruments are California Carbon Allowances (CCAs) and California Carbon Offsets (CCOs). An entity must surrender compliance instruments to the total value of their compliance surrender obligation using a combination of CCOs and CCAs. While CCAs make up the majority of entities’ compliance obligation, this report will focus on the use of CCOs in the next decade. CCOs are carbon offset credits that have been given CCO status by the California Air Resources Board (CARB), i.e. they have deemed the offsets to be eligible for use on the regulatory market. The offset part of the program was designed as a cost-containment mechanism. Entities are permitted to surrender up to 8% of their total emission obligation as CCOs. Offset credits are less expensive to buy than CCAs, hence using offsets keeps an entity’s total compliance bill lower whilst simultaneously funding offset projects which have numerous other environmental benefits. In 2021, the rules for CCO surrender are changing under AB398, such that an entity may surrender just 4% of their total compliance obligation as offsets. This limit will then rise to 6% from 2026 to 2030. The supply of CCOs to the market is crucial to an entity’s compliance strategy – in terms of availability and cost of CCOs. Since the cap-and-trade program began, CARB has issued over 135 million CCOs. Of these, there remain 88.2 million available for compliance, with the others having been either surrendered, invalidated, held in entities’ compliance accounts or placed into a “buffer pool” by CARB in case of unexpected invalidations. CARB issues CCOs bimonthly. 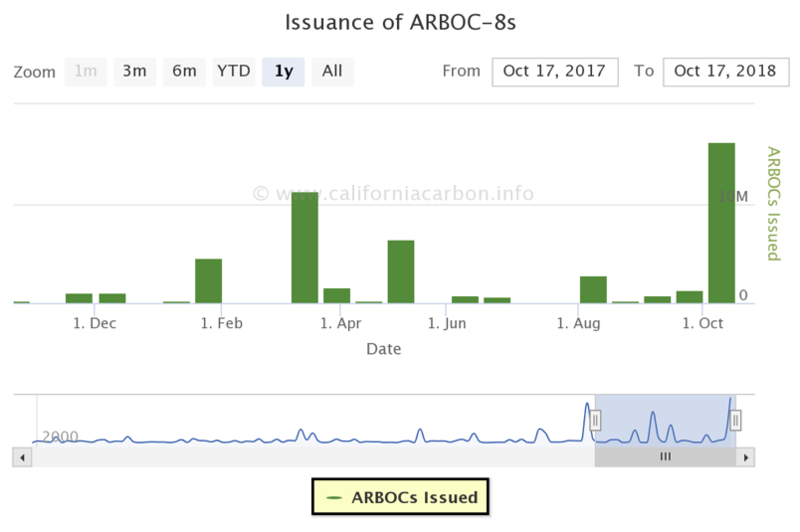 The graph below shows the most recent CCO issuances and evidences the inconsistent nature of the size of issuances (see graph on CaliforniaCarbon.info to track future issuances). Vast forestry projects have the ability to add a sudden glut of credits to the supply, as we saw in last week’s issuance where Finite Carbon’s Ahtna Forestry Project received over 14 million CCOs. CCOs from forestry projects currently account for around 80% of all issued CCOs, and because of this are vital to the supply of CCOs to the regulatory market. So far in 2018, 43.7 million forestry CCOs have been issued by CARB. As per CaliforniaCarbon.info’s short-term forecast model, a further 15.2 million forestry CCOs are expected before the end of the year. As shown in the graph below, the aforementioned Finite Carbon forestry project has accounted for most of the expected issuances in Q4 2018. There are still seven million credits expected in this quarter, of which three million are attributed to another Finite Carbon forestry project. There are also some delayed credits that were initially expected to be issued in previous quarters, totaling just under eight million. Due to the complex nature of forestry projects, and the calculations that must be validated, it is not uncommon for there to be a large lead-time before CARB issues a project CCOs. The forestry issuances expected in 2019 and 2020 are lower in volume, totaling 21.4 million and 17.2 million CCOs, respectively. The forecast model is updated every two weeks, following CARB’s bimonthly CCO issuance. Taking a look at CCO supply on a longer timescale, the chart below shows expected CCO issuances up to 2030. As well as considering projects that have already been listed, future project listings have also been simulated based on historical trends of the various protocols. CCA/CCO price differential: At times where there is a larger gap between CCA and CCO prices i.e. if CCO credits are available at a much lower price point than CCAs, the financial reward for using offsets is larger. Volume of emissions: as per the above, entities with larger emissions benefit more from a (for example) 20-cent saving per ton of carbon. Internal resource and capacity to manage offset purchases: Investing resources into understanding the offset market, or engaging a consultant to do so, may not be beneficial for smaller entities with lower emissions. Expected market movements: Entities are permitted to hold offsets in their compliance accounts, without surrendering them. They can, therefore, strategize as to the most beneficial timing for surrendering offsets, based on expected future CCA and CCO prices. Appetite for risk: In California, the CCO buyer carries the invalidation risk –any entity that has surrendered an offset credit that is subsequently invalidated, is liable for a non-compliance fine. If an entity has not yet surrendered this credit but holds it in their compliance account, it still incurs a financial loss. The graph below shows the expected supply of CCOs and the maximum possible demand. It is evident that in some years, maximum demand exceeds the expected supply, which is a cause for concern for companies who are reliant upon offsets to contain the costs of their compliance. CCO prices generally track CCA prices, yet are also subject to normal market fluctuations and driven by supply and demand. In previous compliance surrenders, the maximum possible demand for offsets has not been reached; if this trend continues, forecast supply will allow demand to be met. CARB will publish the details of this year’s compliance surrender in December, shortly after which CaliforniaCarbon.info will publish further analysis of CCO usage in compliance surrenders. For more information and analysis on CCAs and CCOs, please visit californiacarbon.info.